The Half on the Head course map and elevation is outlined below. You can also view a Garmin interactive view of the proposed route. 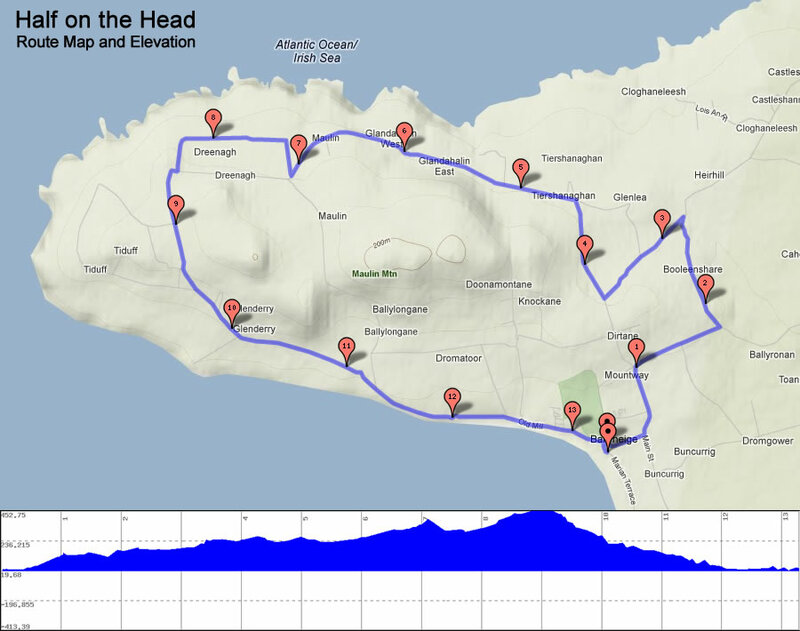 The Half on the Head follows a wonderfully scenic course from Ballyheigue Village right around the Kerryhead loop before ending up back at the start point. The 13.1 mile run takes you along one of the most unspoilt portions of the Wild Atlantic Way. Run beside the Shannon Estuary with views across the river mouth to the coast of Clare. Glancing back you will see the rugged Kerry coastline stretching to the town of Ballybunion. You might even catch a glimpse of the fabled Cliffs of Dooneen. Upon rounding the point of Kerryhead you will experience the magnificent panorama of Tralee Bay with Mount Brandon and the Maherees as a backdrop. Further along you have stunning views of the coastline stretching from Ballyheigue beach to Banna and Fenit with Blennerville Windmill in the distance. The first half of the course meanders gradually uphill before levelling out at the point of Kerryhead and then beginning a steeper decent back towards the village. Visit our BLOG for details on how best to tackle the route.